I loved both the film and the book! it’s a trick of the light, the glass is a golden yellow but shooting into the sun the room absorbs the golden glow & the glass looks frosted, I love this fragile old house. I love your high ceiling space. I can imagine you working at that desk, your face bathed in ligiht. Looks like a Renaissance painting. I can picture you there, poised/posed as a Vermeer. oh ha! the crone with the feather earring! to be able to paint that light… perhaps in the next lifetime! 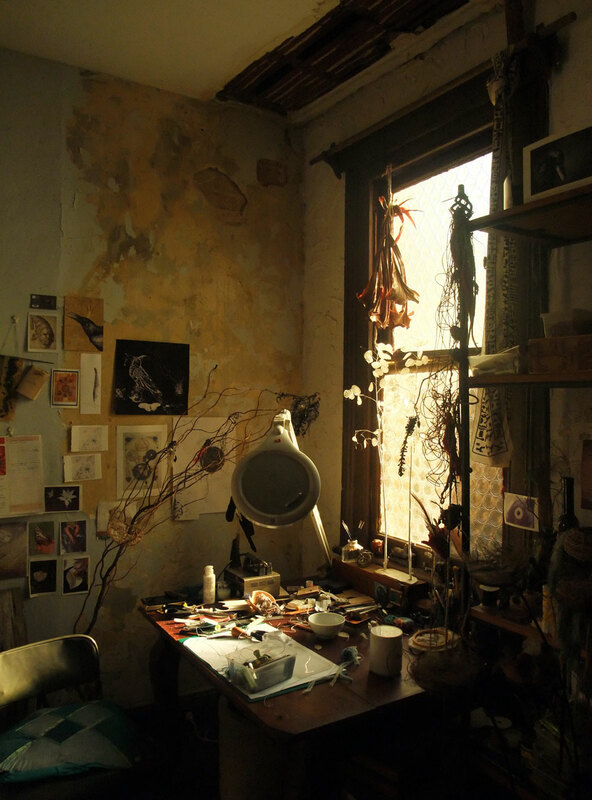 Beautiful light and always good to peek at the work area! funny how many of us swoon over the light — me, too! the amber tones. it feels so YOU this still life, somehow. I love this space so much, even when it was an internal waterfall every time it rained for 18 months until Greg the best handyman/carpenter in the world fixed the flashing & replaced the rotted barge board because the tin had been cut too short the last time it was reroofed, which must have been quite some time ago as our roof is very rusty, the house stays dry these days even when the weather is wild, wet & windy, touch wood! Funny that the beautiful distressed walls were made by rotting wood and insufficient tin! I always have a quiet chuckle when I see “distressed” furnishings, cloth and paint finishes, this is the real deal!